The Oakland Coliseum opened in 1966, and is the fifth oldest baseball stadium currently in use. It also is the only remaining American stadium that is used by both a professional football team (the Oakland Raiders) and a professional baseball team (the Oakland Athletics). What’s also unique about the Coliseum is how only 35,067 of its 63,132 seats are available during Athletics games. This makes it the 2nd smallest active MLB stadium, despite feeling like a huge and cavernous ballpark when you’re inside. 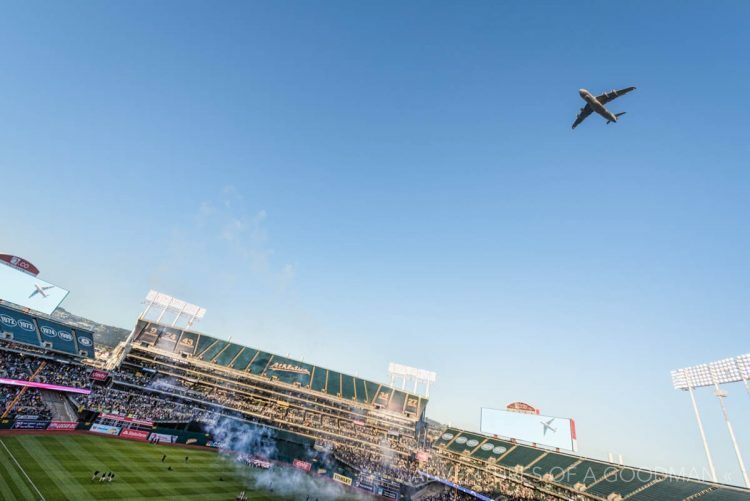 For these reasons and more, the A’s have spent the past decade actively seeking a move to San Jose. Unfortunately, the San Francisco Giants have repeatedly blocked the move. As such, the Athletics signed a new 10 year lease on the stadium in 2014. In the 50 years since it’s opening, the Oakland Coliseum has had quite a few owners and names. From 1966 – 1998, it was simply known as the Oakland–Alameda County Coliseum. In 2004, Network Associates changed their name to McAfee, and subsequently renamed the stadium McAfee Coliseum. In 2008, McAfee decided not to renew their naming rights, and the stadium was once again called the Oakland–Alameda County Coliseum. In 2011, Overstock.com purchased the naming rights, and renamed the ballpark Overstock.com Coliseum. This new name was considered to be something of a joke by Athletics fans … and the snickering only got stronger when the company rebranded itself and the stadium, calling it O.Co Coliseum. Finally, as of 2016, O.Co opted out of the final year of their naming contract. Until some other company decides to slap their logo on the side, A’s fans once again call the ballpark the Oakland-Alameda County Coliseum. One of the main reasons I purchased my first dSLR was to take photographs of Shea Stadium during it’s final summer. I wanted to hang a beautiful print of Shea on my wall, and I wanted it to be one that I had taken myself rather than purchased online. And thus began an obsession. In the years since, I have brought my gear with me to nearly a dozen stadiums, climbing up to every possible vantage point and snapping away. My 12-24mm wide angle lens does ok, but nothing beats the 10.5 fisheye lens for getting in the entire stadium.